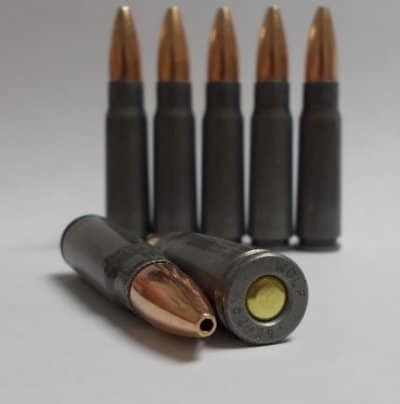 When it comes to ammo, the 7.62×39 is very highly spoken of. Ever since its adoption back in 1943, when prototype cartridges were first developed for the M43, both military and civilian shooters have been impressed by their capabilities. Though 7.62×39 ammo and .30-30 are very similar in ballistics, the former will serve you far better, especially when you account for its limitations. Note that this particular case is one of the foremost options for introducing unexperienced or recoil-sensitive shooters to the art of centerfire rifle shooting. This cartridge was designed by Boris Semin and Nickolay Elizarov, who noted that the M43 used a .311” bullet diameter (much like other Russian cartridges, including the 7.62×51). The difference, however, was that the rimless case of the 20”” barrel was smaller and contributed to a velocity of 2300fps with a bullet weighing 123 gr. Even so, it was only the semi-automatic SKS 45 that became the first rifle to use the cartridge. In 19497, Mikhail Timofeyevich Kalashnikov designed what would soon become a world-famous rifle: the AK-47, a robust and reliable selective fire design whose qualities ensured its eternal popularity. Curiously enough, the 7.62×39 M43 cartridge was gradually phased out by its .22” caliber counterpart, the 5.45×39. Even so, 7.62×39 ammo is more than adequate for both close range hunting and lighter medium game. When considering bullet diameter, note that SAAMI standards for bullet diameters dictate that they be no greater than .310 minus .002. Since .308 bullets meet the spec, you shouldn’t be at all surprised that certain guns chambered in the United States use this particular diameter. Be mindful, though, that this raises a particular issue: there are numerous .310 bullets available for the 7.62×39. If they’re fired in a barrel that is only .308 in diameter, they may produce higher pressures. Ideally, you should know the exact dimensions of your gun. Though things may differ nowadays, most 7.62×39 use a steel core (which makes it light armor-piercing). Note, therefore, that hollow pointing is useless in causing mushrooming. All you’ll be left with is instability on impact. Ideally, the 7.62×39 should be used for hunting lighter medium game at close ranges. When loaded with expanding bullets, the 7.62×39 produces good results despite its somewhat disappointing muzzle velocities and low BCs. It’s only after 100 yards that its width of wounding tapers dramatically, so that at approximately 200 yards, such soft bullets lose their ability of creating fast-killing wounds. Both China and Yugoslavia attempted to create rifles that cater specifically to the 7.62×39 cartridge. Ruger’s M77’s and semi-automatic Mini 30’s are also contenders, though they force .311” projectiles down to .308” (because of their .308” bore size). Even so, such rifles can produce a respectable accuracy: between 1 to 3 MOA. Let’s simply assume that you care deeply for your rifles. You have to thoroughly research the origin of your ammunition, especially in the case of the 7.62×39. Since there is a great number of corrosive primed 7.62×39 surplus ammunition circulating, you’ll have to avoid it. Because of the corrosive priming, such ammo is harsh on the gas systems of conventional military rifles. In the end, it will end up eating through chrome-lined bores. It’s tough to identify the best 7.62×39 ammo out there, though there are some contenders. Cheetah, from Vector Arms, for instance, is brass-cased, non-corrosive and while you may sway towards a steel case, arguments can be made that the force required to extract that steel case from the chamber would be significantly higher than that required for the brass case. Barnaul is another great contender, as are Winchester, Federal and Remington, which produce 123 to 125 soft point ammo. They advertise velocities of up to 2365 fps, with average velocities of 2300 fps. Terminal ballistic expert, Dr. Roberts, notes that Federal soft points may prove a bit disappointing as they fail to reliably expand. Curiously, though, Brassfetcher also conducted tests and concluded that there were no issues with the soft points expanding. Laupa also produces great ammo. Their 125 gr soft points have a great performance, the only issue is that they’re particularly hard (and expensive) to find in the US. Both these bullets can be shot through 20” and 22” barrels and produce approximately 2350 fps. The only issue with Hornady is the fact that it experiences a lot of early fragmentation. Despite its decent penetration, you may have to experience if it works for you (when hunting, you may find that all the fragments don’t allow you to truly savor your prey). But despite all these great manufacturers, there is currently one ammunition brand that stands out among the rest when it comes to 7.62×39 ammo. Corbon would be your best choice (despite the fact that they may seem a tad pricey). This ammo offers adequate penetration and expansion. You may choose from Corbon’s 125 gr hollowpoint and its 150 gr soft point. For hunting purposes, it’s recommendable to choose the soft point. Now the issue is to experiment and find which particular ammo you’re most comfortable with. That depends a lot on your rifle and where you choose to hunt. Hey Buddy!, I found this information for you: "Versatility and Efficiency: 7.62×39 Ammo". Here is the website link: https://thegunrights.com/7-62x39-ammo/. Thank you.